The RAM 3500 offers bold styling with an aggressive "grille-forward" design, interiors with premium materials and innovative features, and big power from a Cummins diesel engine, making it ideal for work and play. 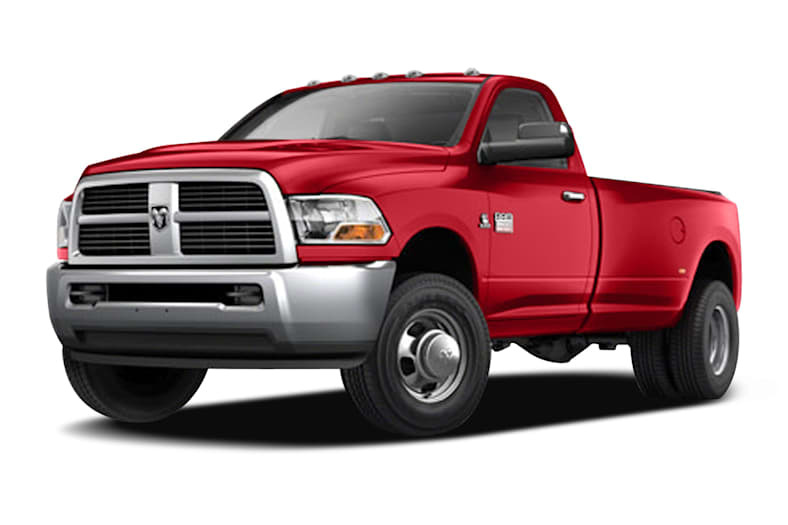 The RAM 3500 provides something for everyone with the choice of three cab styles (regular, Crew and Mega cabs), four wheelbases, single or dual rear wheels and either 4x2 or 4x4 drive types. Power is provided by a 310-horsepower 6.7-liter Cummins diesel engine with a standard 6-speed manual or optional 6-speed automatic transmission. The diesel engine features 800 lb-ft of torque when equipped with the automatic transmission. Available safety features include dual front airbags, curtain airbags and anti-lock brakes. Heated and ventilated front seats, heated rear seats, heated steering wheel, power adjustable pedals, rear parking sensors, and a rear backup camera are available. Electronic and infotainment choices include a multimedia system with 40-gigabyte hard drive, navigation system, and a rear-seat DVD entertainment system. For 2012, stability control is now standard equipment on all single rear wheel trims. ST trims now have a black grille and bumpers, and Laramie and Laramie Longhorn trims now include a standard navigation system and Sirius real-time traffic display.